The Scum Scrubber is a Hydro type weapon. The Soap Dispensing Pollution Disposal Unit, a.k.a the Scum Scrubber, is the Laboratory's way of fighting back and cleaning up the mess that was made. Twin sudsidizers produce the soapy liquid that is shot out of the Pressure-MASTER™ 3000 at 3000 PSI of pure cleansing power! The Clean-Claw™ holds mice still while they get the shower of their life! 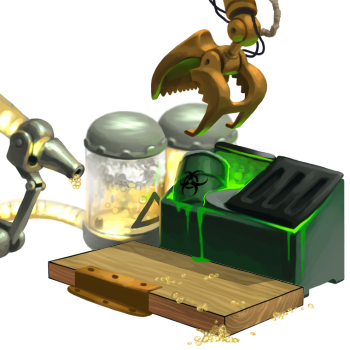 The claw collects leftover toxins and residue and properly* disposes it. *Disposal method carried out in accordance with Section 45, Line 452 of the King's Safety Act of 1999. The Scum Scrubber is not sold by any Trapsmith. It can only be crafted given the proper ingredients. The Scum Scrubber (if unintentionally smashed) can be reassembled from Scum Scrubber Trap Parts. Smashing this weapon with the Hunter's Hammer yields Scum Scrubber Trap Parts. 21 January 2014: The Scum Scrubber was introduced with the release of the Toxic Spill. 26 February 2014: The first Scum Scrubber was crafted at the end of the second Toxic Spill. 28 October 2015: The Scum Scrubber becomes smashable with the Hunter's Hammer, and can be rebuilt from Scum Scrubber Trap Parts.